Just Jingle: Babies and Sugar Skulls. Not to be confused with Sugar Baby Skulls...'cause that would just be weird. Just say'n. Babies and Sugar Skulls. Not to be confused with Sugar Baby Skulls...'cause that would just be weird. Just say'n. DO NOT FORGET TO CHECK OUT THE BLISS HABITS GIVEAWAY! There is $100 in Creative Spending money up for grabs!!! Well, actually, it wouldn't be ALL that weird, considering the Day of the Dead tradition in Mexico. If you are not familiar with it, the idea is that on November 1st the spirits of children who have died are allowed to come back to visit their families and then on November 2nd the adult loved ones join them. It is a great celebration and all quite fascinating, actually. I found this wonderful website with more information if you are interested. BUT...the reason I am speaking of the Day of the Dead today, this fine November 2nd, is because I created my own version of a sugar skull. I didn't use sugar, of course...that would have been disastrous. Yup. A yummy, yummy, delicious disaster. Just say'n. HA! I created mine with air dry clay and you can find the complete tutorial over on the Creative Paperclay® blog! Get out the glitter, folks, 'cause this one is gonna be fun!!! I really enjoyed making this piece. I've wanted to do a sugar skull for quite some time and having the blog assignment for this day was the PERFECT excuse! You should probably follow that blog. We have LOTS of fun stuff for you over there. Just say'n. BUT, alas, that is not all I have to share with you, today. Nope. I've got more! I've got a baby card (hence the title...) to show you! 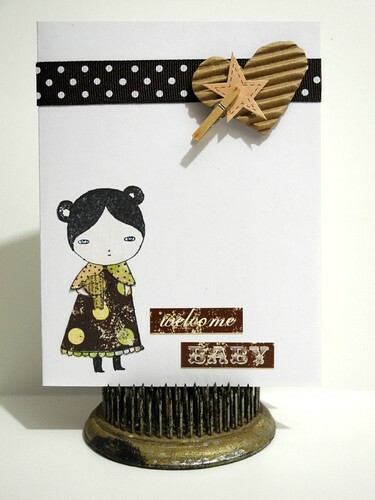 A super wicked crazy cute baby card at THAT! *sigh* CUTENESS!!!! 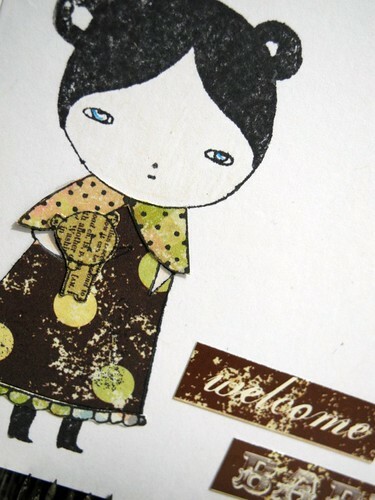 I used a fabulous Danita stamp from 100 Proof Press, called Danita with Bear. Isn't she just the cutest thing you ever did see? She is. I'm telling you and I'm always right about these things. Just say'n. I paper pieced the image with Simple Stories papers. They are SO cute!!!! I love the colors! The stickers are from the same collection. The ribbon is May Arts polka dot grosgrain cuteness and the corrugated heart is from Jillibean Soup. The puppy hair is from either Maggie and/or Thatcher and came free of charge! HA! I added the adorable clothespin and just about fell in love! ...boring, but READY and WAITING for the next project! I may be feeling a creative surge coming on!!! I love those!!!! To see more fabulous workspaces, check out Julia's blog! It's so much fun!!! And join us any Wednesday!!! Jingle out, folks! Have a wacky Wednesday! GREAT sugar skulls!! I am wearing my day of the dead t-shirt right now while my students are taking their 1st quarter exam! love day of the dead! i have a shout out to you on my blog today! Love this card you've just made, adorable! And loved!!!! your new shrine you made for Retro Cafe Art!!! Always love your work! And always appreciate your messy work desk! You should see my entire art room at the moment! Wouldn't make any magazine articles for sure! LOL! LOOOOVE your skull! (Wait. That sounds weird, huh? LOL!) In humid Houston, I can use Paper Clay ONLY on dry days. Otherwise it takes forever to dry. But I love the stuff! Bought so much over the past few years, I SHOULD own stock in it! And your card is super adorable! Your desk? OMG! 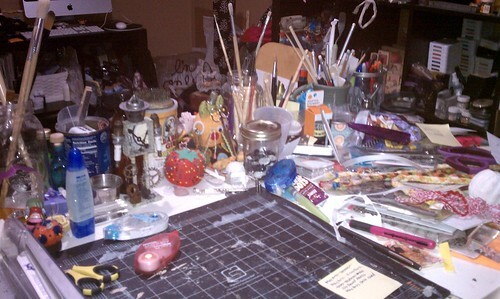 My workspace is SOOOOO messy today & yours looks GOOD! Hugs, and go create LOTS more pretties for us to see! your desk is anything but boring! so love your new baby card, fabulous paper piecing! That card is sooo cute. And your desk Madam! Get it cleaned!!!! Only joking!! Haa Haa! Cute card - I love Simple Stories :). 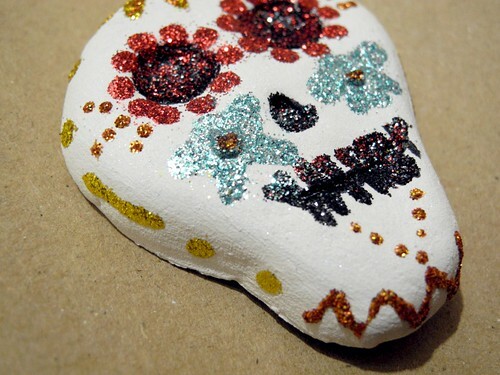 Love, LOVE the sugar skull! 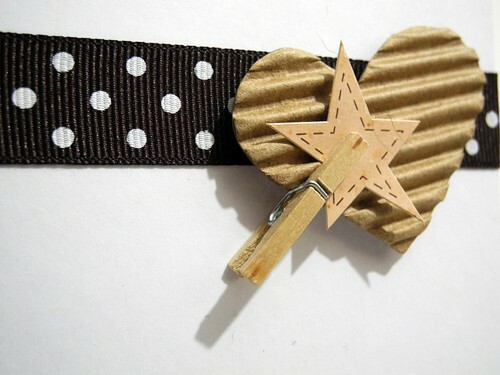 And the heart, star, clothes pin combo is FANTASTIC!! Love the projects today! The baby close pin on the baby card is adorbs! Cool skull! :) And I love your card! Your skull is great! Next time, try sugar. It isn't that difficult when it is a solid piece. Great card. Desk is busy not boring. Wonderful card! I love the little embellishment cluster with the peg and the heart - gorgeous. Love the skull, always so creative.........you rock girl. Cute card, Your paper piecing is perfect. Aaack....that little clothes pin is the PERFECT touch on that card!! First thing I noticed in the whole blog post! I've always been attracted to these skulls but had no knowledge of "Day of the Dead!" Who knew?! I'm loving this card with the clipped on star... it sort of looks like a shooting star that way! Love your card! Great composition and fab visual textures! YOur desk is filled with characters, standing by in between bottles and boxes and tapes and supplies...don't change a thing will ya!